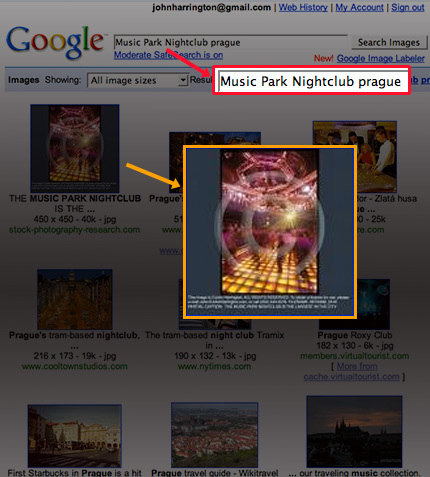 More and more, prospective clients are searching for imagery on the internet, and, more specifically, Google Images. Yes, the other search engines have image search, but for today, we'll limit this discussion and comparison of capabilities to Google's systems. 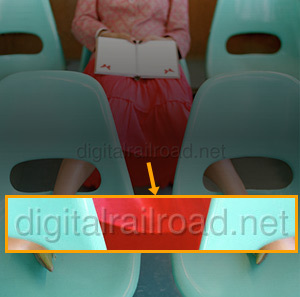 How do we compare SEO (that's search engine optimization if you're living in the dark ages) between the industry behemoth Getty (and their ankle-biter brands) with Digital Railroad, PhotoShelter, and, for kicks, our own SEO efforts. 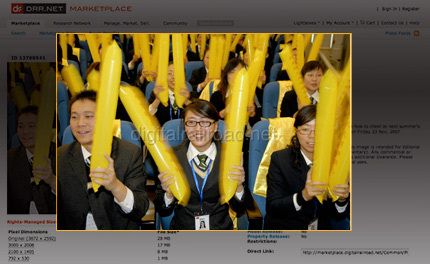 Notice that Jamd is Getty's consumer media website (About the Image - reported here, 7/11/08). Jamd appears in position #1, #3, and #13. Several years ago, I obtained several URL's for this purpose. One of them is www.Stock-Photography-Research.com. Going there, you can browse though several thousand of my images, but they're not designed for you, the individual, to browse. 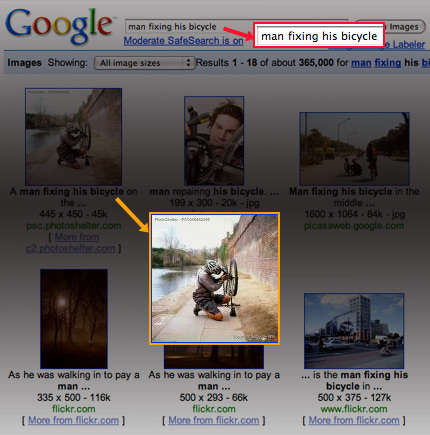 They're designed in a way to maximize their ability to be returned on the search engines. 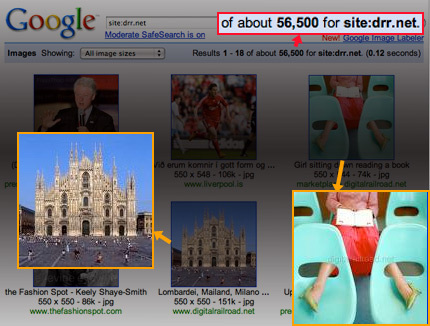 photographers who are doing both, are doing themselves a disservice if their goal is to show up high in search engines." 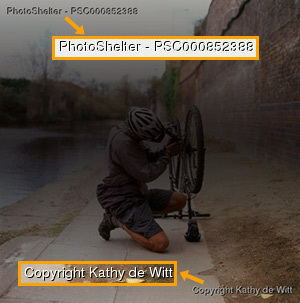 To that end, you can see how PhotoShelter (above, on the "man fixing his bicycle" search) and Digital Railroad (left) are unobtrusively watermarking their images with information. 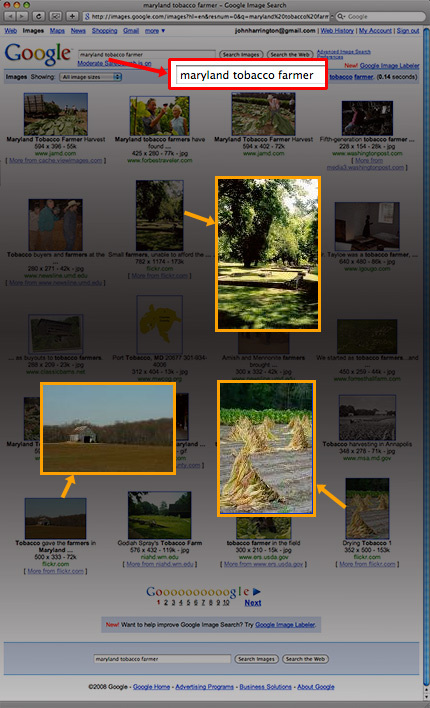 DRR's watermark appears with a center- aligned one, while PhotoShelter has the photographer's copyright information, and PhotoShelter ID# in opposite corners. We also provide summaries of a page in the meta-description header and, when available, include keywords about the image. 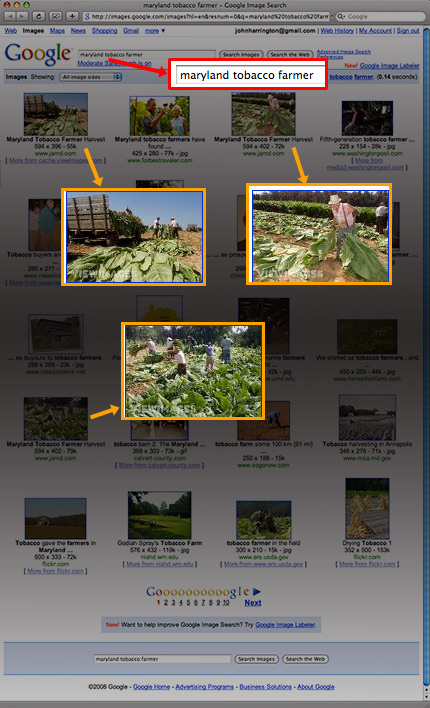 Our photographer and term index pages include links to RSS and Atom feeds that provide another mechanism for finding images. We provide sitemaps to the major search engines. The sitemaps are updated on an hourly basis to provide pages as quickly as possible to search engines, and by registering our domains with the major search engines we can monitor our site for any problems that may prevent indexing. In addition, we are working with search engine vendors to prepare other forms of sitemaps that provide more information about our images." Whew, that's a lot of information, but really shows how committed to SEO PhotoShelter is, and DRR's CEO's comments before echo the importance of getting their images to appear in the of Google Images. With thanks to PDN (here) and MediaPost (here) for bringing this to my attention. I wrote about this in my book - essentially, if you're a staff photographer you must be prepared to become freelance unexpectedly. 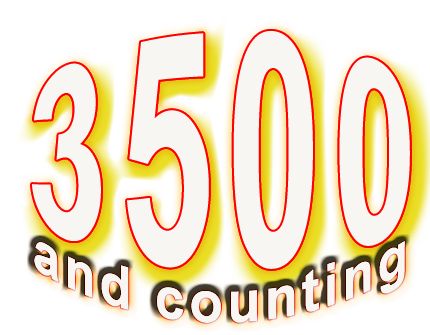 3500 people (and counting) are being forced into the freelance world (from all areas of the media newsroom) without notice. Back in April, I wrote Staff Photographers - An Endangered Species, which is worth a re-read. For staffers, your first thing to do will be to have a website. I know of several current staffers who have their own websites. that means having your own business cards to hand out where appropriate. This means knowing how to send a contract and figure out rates and rights. Oh, and if you're one of those staffers who used to look at a $200 freelance job as gravy to complement your meat-and-potatoes staff job revenue, and now you're out of a job - those clients you have expecting you at $200 you can no longer afford to work for. This alone should be an argument for why you - as a staffer - shouldn't be doing these jobs at side-job rates, not to mention how doing this affects your freelance brethren's ability to charge a living rate in your community. If your normal rate for a wedding is $3,500, or a press conference coverage is $750, or your family/pet/child portrait sitting rate is $350 and an enlargement is $950, then rather than trying to convince your newfound friend to charge those rates - book the job on their behalf - at those rates. By doing so, your friend will soon realize that that is what they're worth, and will apply that same rate structure to people calling them directly. Everyone, from time to time, gets a call for a period that they are double-booked. Don't forward on the job, and hope your friend does things right - do it right for them by taking the job and then you hiring your colleague to do the assignment, and you passing through the assignment fee to them. What chance to do it right do they have if they've never negotiated an assignment rate, or a rights package, before? By embracing, and helping these talented people out, not only are you doing a nice thing, but you're also ensuring that your community will remain robust and survivable amidst the constant downward pressure on rates. Contracts - If a photographer has been a staffer for awhile, it's likely their last agreement to provide photography was done on a handshake. If a photographer has only been on staff for year or so and came straight from school, they too don't understand the importance of a contract - signed by them and the client. Offer to give them a copy (prefably in a Word document so they can edit it) of yours to get themselves started. Equipment - They likely need help getting their equipment setup. They may have been given their old equipment from their place of work, but in most cases the gear is on it's last legs. Redundant camera bodies, and lenses ranging from ultra-wide - 14-24mm Nikon, or 16-35mm Canon, all the way to 200mm lenses for each, plus two strobes, and a Jackrabbit/Quantum battery pack will be sufficient. In the rare case that they are going to do sports, or major news events, a 300mm with a 1.4x or 2x teleconverter is useful, but freelancers headed that direction with a need to sustain themselves are not going to find a lot of success chasing sports. Software - They may have their own laptop, but are unclear about the importance of backing up their images, and acquiring legal copies of the software they'll need. Don't start them off on the wrong foot by giving them copies of your software. We recommend they get full versions that are registered in their own name of Photoshop, Photo Mechanic, FotoQuote, Microsoft Office 2008 , QuickBooks Pro . They should also read: © Infringements - Don't be a Hypocrite. Dealing With Clients - Send them this link - Lies, Lies, and More Lies , Traitors Among Us?, and this link - Top Ten Lies Told to Naive Photographers, and encourage them to read the posts - the first two are mine. Then, be sure to tell them that when the client says "oh, you're the first photographer I've talked with that has a problem with __________....", where the blank is either "work-for-hire", "wanting to be paid", "charges for post production", or "wanting a contract signed"; they they're being dishonest at best, and more than likely, lying. Marketing - This one's tricky, because if you're not careful, you'll teach your newfound freelancer to compete for your own work - and will be doing so without the understanding of the true costs of being in their new shoes as a self-employed person, and so may well undervalue themselves (they did just get laid off, remember? Their self-worth wounds likely need a bit of time to heal before they remember that they're worth a lot.) About two weeks ago, I wrote a piece titled Getting Clients - A Few Options, that could be helpful. Most important is to get a website that you can get online fast, and is easy for you to make changes to - Effective SEO - Please Welcome liveBooks, talks about the solution we recommend highly (and yes, they're an advertiser here too). Once they get a website, they can begin their marketing campaign. The notion of having a printed portfolio these days applies maybe to 10% or less of the assignment work out there (much of which is in the advertising field) so the online version of that is the best route to go. Pricing and Rates - The FIRST thing you should do is send them to the NPPA's pricing calculator. This calculator works for the vast majority of photographic fields, and gets your colleagues thinking about the true costs of being in business - which in turn, will assist them in calculating what they should charge. Reading Good, Fast, and Cheap - Pick Two, that I wrote in May is probably a good place to send them, also Selling Something You Don't Own is a cautionary tale. Cautionary to the person doing the helping is that neither of you say "we'll agree to charge $X for this..." because that could get you in a bit of hot water with the anti-trust folks. Discussing what an assignment could cost is one thing, agreeing what you both would charge is another. The biggest problem with photographers rates is not that they've been artificially inflated to a price that's too high, it's that photographers fail to contemplate the total costs of being in business, and thus price jobs too low. Longevity - I sat at dinner three nights ago with a colleague who had thought he'd gotten his golden ticket - a staff job at a community newspaper. Just under three months later, he was laid off. Guess what? He wasn't eligible under the rules that applied to him, to even collect unemployment. Everyone is replaceable. No one is safe. Then there's Where Does All Your Time Go?, that's all about time management and why $100/hr does not multiply by 8 hours a day, 5 days a week, and 52 weeks in a year to become a photographer that's paid $208,000 a year, and how $100 an hour isn't enough. Lastly, I'd suggest they read: The Conundrum of Doing Nothing, that I wrote about how to get things going, and getting a few of the books that are at the right of this page - they are the tools that I used as I was growing my business.